I've now written about eleven of the twenty two branches of the VPL! Or at least "written about" them in some cases. It's taken far too long to get this point, and I'm sure there will be more delays and asides along the way, but I am still committed to this project. 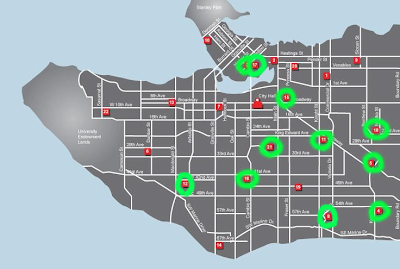 On the map above you'll see the libraries circled in hideous green are the ones I've been to (and in several cases gone to over and over again). You can kind of tell what parts of town I go to just by looking at this map! If you have suggestions for where I should go next, or anything about specific libraries I should check out, please let me know! Public libraries are awesome. And Vancouver has lots! So we're going to go to all of them! Plus ones in other cities! Two Fisted Librarians: A pulp fiction anthology zine. 365 Zines a Year: I review zines and minicomics. Send me yours! 365 Artist Trading Cards a Year: I make tiny collage things. Trade with me!